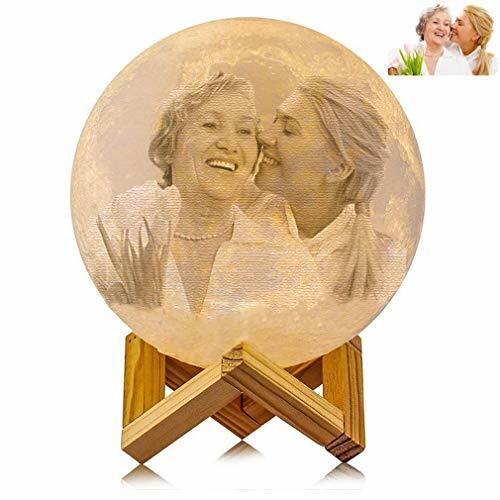 DIY Moon Lamp 3D Printed Moon Light Customized Photo Name Personalized Gift for for Kids,Lover,Family,Friend,Birthday,Bedside Features Two color: Warm white and Cool white Material: PLA plastic. Working time: 8 hours. Battery: 400mAh. Power: 1W. Charging voltage: DC 5V. Made by innovative 3D printing technology, with delicate texture on the surface, looks like a real moon. With artistic wooden stand base for holding the moon light securely. Instructions: Touch the switch within 1 second to switch light color, and touch more than 1 second to adjust the brightness of the light. Easy to charge with USB cable. Red light on indicates it is charging, red light off indicates full-charged state. Size: Diameter: 4 Inch/10cm, 4.7 Inch/12cm, 6 Inch/15cm, 7 Inch/18cm, 7.8 Inch/20cm, 9 Inch/23cm. You can choose your favorite Size. Shipping time : Manufacturing time about 5 - 7 days; Standard Shipping time about 14 - 28 days; Expedited Shipping time about 5 - 7 days; Package List : 1×3D Moon Lamp 1×Wooden Mount 1×USB Charging Cable 1×User Manual Notice: 1、please charge this moon light through PC usb port(DC5V,500mA) for longer life time! 2、The product does not have waterproof ability, not strong acid,alkali. 3、The product can not be strongly hit or fail from high.